Mumbai Indians and Delhi Capitals go head to head in the third match of Indian Premier League 2019 (IPL 2019). This is Mumba Indians’ home game is being played at the Wankhede Stadium. Meanwhile, Mumbai Indians have won the toss and have opted to bowl first. This the first match of the IPL 2019 for both Mumbai and Delhi. For live score updates of MI vs DC, click here. There is little to separate between Mumbai Indians and Delhi Capitals. In 22 meetings, Mumbai and Delhi have won 11 each. Interestingly, in the last five meetings, Mumbai Indians have won three matches against Delhi Capitals. However, last season, Delhi won both its matches against Mumbai. Ahead of the season, Mumbai Indians received a blow with fast bowler Adam Milne ruled out of IPL 2019. The former champions will also miss the services of Lasith Malinga for the first part of the IPL 2019. Malinga will take part in Sri Lanka’s domestic tournament to be eligible for ICC Cricket World Cup 2019, which starts in May. 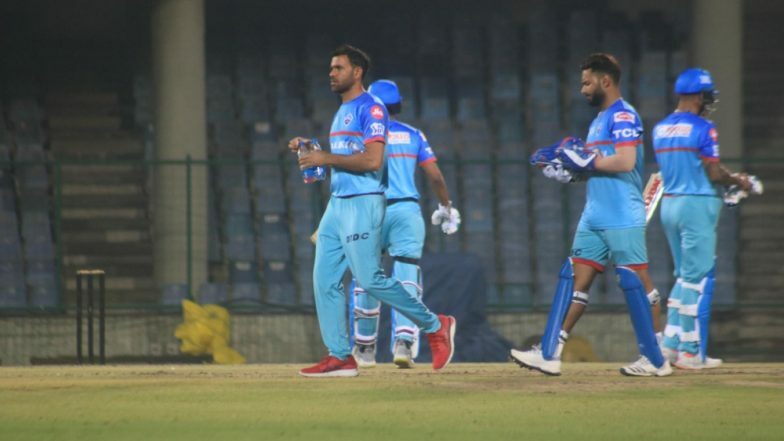 MI vs DC, IPL 2019 Live Cricket Streaming: Watch Free Telecast of Mumbai Indians vs Delhi Capitals on Star Sports and Hotstar Online. With a change in name and colours, Delhi will be looking forward to the new season. After making it to the semifinals in the first and second edition, Delhi has since then struggled and have failed to go past the first round. Under Shreyas Iyer, Delhi will be hoping for a productive season. MI vs DC, IPL 2019, Mumbai Weather & Pitch Report: Here's How the Weather Will Behave for Indian Premier League 12's Match Between Mumbai Indians and Delhi Capitals. Mumbai Indians Playing XI: Rohit Sharma(c), Quinton de Kock(w), Suryakumar Yadav, Krunal Pandya, Yuvraj Singh, Kieron Pollard, Hardik Pandya, Ben Cutting, Mitchell McClenaghan, Rasikh Salam, Jasprit Bumrah. Delhi Capitals Playing XI: Shikhar Dhawan, Prithvi Shaw, Shreyas Iyer(c), Rishabh Pant(w), Colin Ingram, Keemo Paul, Axar Patel, Rahul Tewatia, Kagiso Rabada, Trent Boult, Ishant Sharma.